Replete with imagery, "Florentine" is one of the most intricate designs Gorham produced in the early 20th century. It features the figure of a bearded man at the handle terminus, a pedestal urn laden with fruit midway up the handle, and an array of other fruit and acanthus leaf elements overall. This example is a 9" long, very heavy at 4.3 T. oz., berry spoon. The bowl is large, 3 5/8" long by 2 7/8" at the widest, has decorated flange shoulders, and retains traces of an original gold wash. There is a script "EKW" on the handle front. 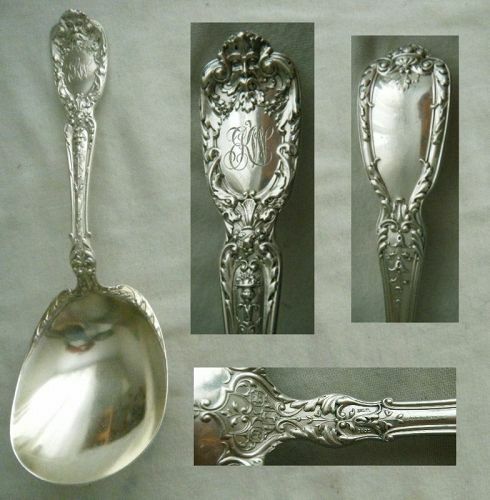 The piece is in very good estate condition, absent polishing wear and having a fine finish. The bowl remains well-shaped and free of dents or bends. The interior shows light surface scratching consistent with normal use. Marks are Gorham's "lion, anchor, G" emblem, "Sterling," and "Pat. 1901."